The COOL Project, described below, started in the summer of 2001 when the first appication for funds was sent to the Research Council of Norway. Staffing has been minimal the first year, but much work has been done on pedagogical modules and in the building of the COOL research community. On 13 June 2002, the Research Council decided to fund COOL for 2 1/2 years, from 1 July 2002. Staffing is now being expanded according to plans. This description is intended for readers that will or may be connected to the COOL Project. Since main products of the project shall be a textbook and other published material, it is emphasised that the intellectual property right will apply to parts of the material presented below: The text and figures are copyrighted. 2.1.2 Implementation and Completion of the GOODS/STAGE Model for Multi-Layered and Distributed Systems. 2.3.1 The Restaurant - "A Sufficiently Complex First Example"
5.2 Commercial Companies Interested in Following and Giving Advice, and Also Later Possibly Taking an Active Role in the Production, Publishing and Marketing Process. Future historians will no doubt agree that the invention of the electronic computer and the amazing subsequent development of the information and communication technologies (ICT) and their reshaping of our societies is one of the major events in the 20th century. Some may regard it as the most important one. In informatics no commonly accepted conceptual platforms do exist, no such bodies of rules, principles, criteria, or unifying perspectives. As ICT more and more permeates our societies, both ICT workers and the population in general need concepts in terms of which they may understand the technology. In the COOL Project we want to use, extend, and complete the approach developed by Kristen Nygaard and his colleagues, and contribute one such unifying platform for informatics based on the process-oriented perspective lectured by Nygaard in recent years. This perspective is a generalisation of the object-oriented perspective. The quality of our education in informatics is now being questioned, both in relation to its content, its pedagogical approach, and the curricula offered to the different target groups in the population. Introductory books and courses in programming are now more and more often based upon an object-oriented language  and are commonly regarded as difficult to understand. They suffer from the lack of a unifying perspective and a pedagogical approach focussing upon the modelling aspects of object-orientation. Instead they start by implanting firmly in the minds of the students those parts of the older, procedure-oriented perspective that are contained within the object-oriented language, before they introduce the basic object-oriented concepts. In a recent Call for Papers to a workshop at an international conference (ECOOP) it was stated: "Successfully using object-oriented technology requires a thorough understanding of basic OO concepts. However, learning these techniques, as well as lecturing about these concepts has proven to be very difficult in the past." In the COOL Project we want to create didactical modules (teaching material organised to serve a specific pedagogical purpose) based upon the platform described above in point 1.1, modules that may be used in introductory courses and in a wide range of supplementary courses. The dominating current pedagogical approach is often justified by the statement that teaching must start with sufficiently simple examples", and this is understood to be examples drawn from earlier, traditional programming. We will instead build upon the alternative approach used by Kristen Nygaard since the inception of OO in the 1960s, and further developed by him: We will start by "sufficiently complex examples", necessitating the introduction of all the basic object-oriented concepts from the very beginning. ICT affords new opportunities for social interaction and learning. ICT can help us supplement traditional instructor-centred teaching (where the focus is on individual learning) by collaborative learning approaches where focus is on multiperspective reflection and negotiation of opposing alternatives and meanings. This field of research is known as computer supported collaborative learning (CSCL). The research agenda of COOL addresses how a variety and combination of ICTs (ranging from Web-based groupware applications to advanced multimedia systems) should be used and implemented in net based CSCL environments. First, this concerns the understanding and exploration of how the didactical modules should be implemented into collaborative approaches at the different test sites. Second, it concerns how central principles of collaborative learning must be integrated into innovative CSCL environments. Third, it concerns an understanding of organisational and infrastructural issues and how the inherent infrastructures at the test cites inhibit or afford the adoption of ICT mediated learning. We will have researchers with competence in pedagogy within the team, as well as close links to researchers at the Simula Research Laboratory and abroad doing experimental evaluation of tools and techniques in software education, use and development. The field of informatics has not yet got a definition that is agreed upon. Some want informatics to be regarded as a formal science, similar to mathematics. In the "Scandinavian School in System Development" that developed from the Trade Union-related projects at the Norwegian Computing Center in the 1970's, researchers are of another opinion and regard informatics as the science that has as its domain the phenomena of information processes and related phenomena in artifacts, society and nature. This implies that system development and system experimentation are important aspects of informatics, and that system comprehension should be taught as an integral part of even introductory courses. (It does not imply any negative attitude towards the use of formal methods) . Exploration, understanding and exploitation of knowledge from bordering and overlapping areas with other neighbouring fields of knowledge should be regarded as important aspects of research in informatics. Informatics is a science in which multiperspective reflection - the consideration of the phenomena from many different perspectives - is essential. In the COOL Project we want to use existing and new knowledge to create pedagogical components to support these views. We believe that learning programming languages should happen in a setting that encourages reflection on languages in general. Students should from the outset be exposed to one target language for the course, but supplemented by illustrations from human languages, from at least one other object-oriented language and from combined visual/textual language and presentation tools. In COOL we will use Java as our target language, with BETA as the other language. It will be possible to reverse this situation, making BETA the target language, using Java for illustrations. We have to deal with sociotechnical systems, understood as partially open systems, within which both people and artifacts (e.g., computing equipment) are actors at various performance levels. Human beings will navigate, using their freedom of will, by manoeuvring within the available action space. This space is delimited by the set of structural restrictions imposed by computer programs, hardware properties and written and unwritten rules of human behaviour. In COOL, the DELTA system description language, developed 1973-75, will be developed and adapted to the description of the manoeuvring space (mainly for human actors) in open situations in man-machine systems. From a human/cognitive perspective, an intuitive way to convey the language issue is to use images for facilitating the communication of knowledge and skills. This intuition is based upon the observation that human beings have communicated using images since the dawn of history. Within the COOL Project we will evaluate a broad range of graphical tool for teaching and programming, and then decide which tools (existing, modified, new) should be incorporated into the COOL modules. An increasing percentage of the population will, in an increasing percentage of their lives, perform their jobs and even live their lives as citizens and family members, in environments in which their actions are structured by the richness and/or the poverty of ICT components. The COOL Partners in Denmark have established a new research center, the Center for Pervasive Computing, to cope with the these multilayered and distributed systems of people, computer components and other artifacts. Whereas all object-oriented languages are oriented towards the mastering of what we today may call a more "traditional" form of complexity, they do not cope with in any powerful or elegant way the pervasive and mobile usage of the new technologies. The exception is BETA, extended with the new language constructs developed in the GOODS/Stage projects (supported by NFR). These tools also allow us to describe and generate and operate in flexible ways systems that one need in order to experiment with and study dynamic work and training situations. COOL will create system tools that will be important to InterMedia's net based CSCL activities. 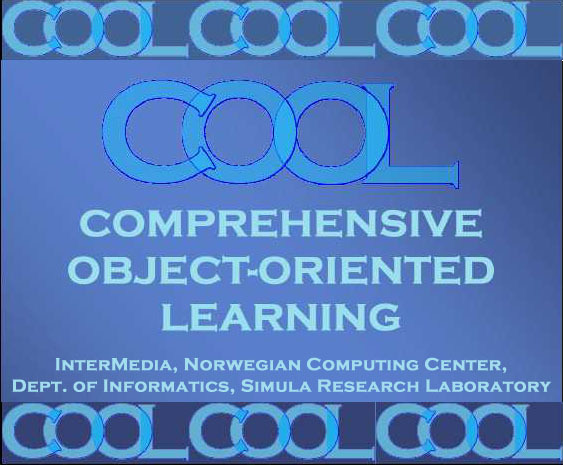 The COOL Project was started in May 2001, when a consortium of four research institution (InterMedia, the Norwegian Computing Center, the Simula Research Laboratory, and the Department of Informatics, University of Oslo) applied to the Research Council of Norway (NFR) for support to COOL. The project work started with the available resources (mainly Kristen Nygaard working most of his time). The NFR decision will be made on 10 June 2002. Both the Norwegian Computing Center and the Department of Informatics, University of Oslo are well positioned to address the concerns listed above and to participate in the COOL Project. The Norwegian Computing Center was the cradle both of object-oriented programming (the SIMULA languages, the DELTA and BETA languages) and of the "Scandinavian School" in system development (through the Trade Union-related projects resulting, e.g., in the Data Agreements and provisions in the law on work environment). The Department of Informatics at the University of Oslo has been a stronghold of object-oriented programming research and teaching, it was probably the first in the world (1973) to offer a course on "Computers and Society", and it has had a curriculum and research in System development since the late 1970's. The new Simula Research Laboratory will follow up a number of the research traditions from the Department of Informatics: object-orientation, system development, empirical research (all relevant to the COOL Project), merging them with traditions and experience from the other participating universities and research institutes. The InterMedia Center is the natural unit within the University of Oslo to coordinate the multimedia and pedagogical efforts in the COOL Project. Among its objectives one finds this statement: "The InterMedia Center shall be an active force within the academic community and towards business and society in confronting the challenges of the convergence of information, communication and multimedia technologies and the resulting transformation processes. InterMedia will address technological, cultural, social, pedagogical, ethical and legal aspects of these processes, emphasising a multidisciplinary approach." We want to expose the COOL pedagogical components to use in regular teaching at a number of universities and colleges around the world. We want to evaluate their usefulness also through controlled experiments run on the Internet, devised and carried out in cooperation with the Simula Research Laboratory. COOL will thus be carried out in cooperation with a global net of test sites, comprising a range of language/culture worlds: North America/English, South America/Spanish and Portuguese, China, France, Scandinavia, probably India and perhaps Africa). By the beginning of June 2002, 14 universities/colleges in these worlds had declared their intention to join COOL, and many others have signalled their interest. (We expect between 5 and 15 sites in each world.) A number of researchers at these test sites have indicated that they also want to contribute to the research aspects of COOL, and not only in the testing of modules. In addition COOL has recruited other very competent researchers that will be members of a research community associated with COOL. Summing up, COOL will contribute knowledge products to sciences related to information-, communication and media technology. Such products will be delivered already early during the project period. The products will be oriented towards teaching of informatics, but will also in their totality contribute to a process-oriented unifying platform for informatics, as well as new insights in Computer Supported Collaborative Learning (CSCL) and pedagogy. Some will have their main effect in contributing to the competence level among specialists as well as the lay public. Most components will probably contribute in more than one way. Other products will, directly or indirectly, create market opportunities. The American Association for Computing Machinery states that object-oriented programming is the dominant style of computer programming in the world today. The impact comes from the conceptual framework of the Simula languages. After the Simula effort the refinement and extension of these concepts have been a main goal for a number of projects: The DELTA system description language, the very powerful BETA programming language, the conceptual development in the GOODS and STAGE projects, and the material developed by Kristen Nygaard and lectured around the world in the last decade. This is the starting platform for the COOL Project. 1. Research papers, being contributions to a number of sciences. 2. The accumulation of contributions to a unifying conceptual platform for informatics and interdisciplinary system and media research. 3. Didactical modules for informatics, building a "Learning Landscape", and introducing an alternative introduction of programming and system comprehension. 4. The layout and content of a marketable knowledge product: a flexible introductory course in programming and system comprehension, for use in universities and colleges around the world, as well as in other markets. 5. Contributions to the knowledge competence in ICT in the population.  1. In informatics no commonly accepted conceptual platforms do exist, no such body of rules, principles, criteria, or unifying perspective. In the COOL Project we want to use the approach developed by Kristen Nygaard and his colleagues, and give contributions to one such unifying platform for informatics based on the process-oriented perspective lectured by Nygaard in recent years. This perspective is a generalisation of the object-oriented perspective." The state of the work on the platform is contained in a comprehensive collection of overhead transparencies and in a manuscript now being written (Kristen Nygaard: "Informatics (Computer Science) A Unified Process-Oriented Approach", 81 pp.) See also Kristen Nygaard: Program Development as a Social Activity, Invited speech at the IFIP 10th World Computer Congress, Dublin, Ireland, September 1-5, 1986, and Nygaard, K., 1997: "GOODS to Appear on the Stage", Invited Speech at the European Conference on Object.-Oriented Programming. Proceedings of COOP 97, Jyväskylä, Finland 1997. In the COOL Project we will extend the platform with a number of components that will complete the platform. Some studies are near completion and papers should be ready during the first year (e.g. on the value concept). The platforms of ideas for other studies already exist (e.g. on language concepts for extended scope control and the adaptation of the DELTA language). Some studies need implementation before further papers should be written (e.g. the GOODS/STAGE concepts implemented in one of the virtual worlds). The Book on a Unifying Approach to Informatics should be ready at the end of the project. The paper will link the value (literal) concept to the process- and model-oriented approach used in the conceptual world of the BETA language (see Madsen, O. L., Møller-Pedersen, B. and Nygaard, K.: Object Oriented Programming in the BETA Programming Language, Addison Wesley 1993). The paper is quite close to completion. It will be co-authored by Birger Møller-Pedersen and Kristen Nygaard. This model is described in Belsnes, D., Nygaard, K., Skretting, J. and Østerbye, K., 1998: "Staging Environments. Technical Annex to the Contract for the STAGE Project. Version 1.0". (57 pages. Norsk Regnesentral (Norwegian Computing Center), Oslo, November 1998). We will integrate the language constructs for distributed and layered architectures already developed in the GOODS and STAGE projects with the general COOL conceptual platform, and adapt them to situations in settings with pervasive computing. We will re-examine and adapt the DELTA language to introduce description elements covering partially closed process prescriptions, in particular for the description of human behaviour as actors in information systems. (See Holbæk-Hanssen, E., Håndlykken, P. and Nygaard, K., 1975: "System Description and the DELTA Language". Norwegian Computing Center, 1975). Concurrency imperatives and imposed property descriptors are discussed carefully in the DELTA report, including the duration of the imposition of a property descriptor upon its system environment. These language elements have to be reexamined in the COOL project. By associating property clauses with objects in an action stack, a dynamically changing set of imposed condition may be described. A performance of an information system will come to a halt if, at some step in the action sequence of a piece of computing equipment, no definite and precise next step is indicated. This will result in inactivity until a triggering interrupt arrives, from either some other artifact or from a human actor. For a human actor this is different. People may themselves decide which next action to choose in such situations, within the limits imposed. When no such choice exists, we will say that the next action (for a person or some artifact) is closed. When there is choice, the action is open. The actions within the performance then become depending upon the choices made by people in the situation, by what may be called their manoeuvering. The situation in the theatre corresponding to what is illustrated, is usually referred to as improvisation. Often the situation is characterised by a manoeuvering in which there also exists a repertoire of available structured action sequences to choose between. It is useful to point out that this mode of system description opens up for the inclusion of very subjectively motivated actions, the details of which are unknown to those making the description. Collaboratively oriented learning approaches are particularly well suited for organising a process- and problem-oriented view on informatics. Multiperspective reflection and negotiation of opposed alternatives are basic didactical principles. In the COOL project we want to develop pedagogical models that incorporate the didactical ideals of multiperspective reflection into innovative CSCL environments. The design rationale behind the pedagogical models is to utilize the qualities and characteristics built-into existing ICTs and organisational components at the test cites, and incorporate them with the didactical modules. There exists a rich body of literature that presents and discusses issues connected to collaboratively oriented learning in general, within the boundaries of face-to-face- oriented educational systems (e.g., Dillenbourg et al, 1996) on the one hand and, within a distributed learning context on the other (Dirckinck-Holmfeld, 1990; Mason & Kaye, 1990; Harasim et al, 1995; Sorensen, 1997; Fjuk & Dirckinck-Holmfeld, 1997; Fjuk, 1998). There exist few (if any) reports, however, that explore how collaborative learning should be operationalised and implemented across the boundaries of many ICT solutions and organisational components. Experience from the use of the components should be collected from the second half of 2003 on. Experiments should be performed from 2003 on. The first reports should appear in 2003. Some didactical modules are rather well defined already, and production may start in the autumn of 2002. Other need completion of research before production may start. We also expect very useful input to module production from researchers at the test sites. The plan is to create one world related to road traffic models, one related to document handling in an organisation, and one related to the interconnection of equipment in a multimedia setting. These modules may require considerable amounts of programming. From a human/cognitive perspective, an intuitive way to resolve the language issue is to revert to using images for facilitating the communication of knowledge and skills. This intuition is based upon the observation that human beings have communicated using images since the dawn of history. The field of Visual Programming Languages (VPL) has taken the hint and has tried to augment and enhance textual programming languages with images since early 1960's. Empirical findings seem to support the (initially) intuitive reasoning behind attempts to enhance programming languages by adding visual elements. In terms of program creation, the findings are consistent and point to the fact that visual approaches in many situations outperform traditional textual approaches for this task [Baroth & Hartsough 1995], [Pandey & Burnett 1993]. Within the COOL Project we will as a first step consider and evaluate existing visual tools, both for programming and visualisation in cooperation with the COOL Project test sites and the associated researchers. We then will decide which tools we will use and which new tools we will implement. The practice, research and attitudes in information processing is influenced by the past. Familiarity with the history is useful for understanding important aspects of the situation today. The COOL approach will not amass facts about all kinds of machines, companies, software etc., but instead to illuminate underlying attitudes, beliefs and interests that explain events and trends. This module will be an extended version of the Turing Lecture by Dahl and Nygaard. This lecture will examine, step by step, how the basic object-oriented concepts were created. The format will be a video of Nygaard giving lectures. This module has been lectured for many years, and a comprehensive set of overhead transparencies does exist, as well as a manuscript in writing. It needs critical re-examination by Nygaard together with the researchers and associated researchers in COOL. The first version of this module should be ready for use in the autumn of 2003. Much material is already existing, and will be used during the project. A first version of the textbook should be ready by the end of 2004 A final version one year later. There is a strong demand for a coherent introductory course, malleable to adaptations to local culture and resources. We also want in the COOL Project to propose what we will consider a suitable introductory course - a specific trail for traversing the Learning Landscape becoming acquainted with and making use of a set of pedagogical and organisational components. There is no doubt a large world market for such introductory courses, a reasonable guesstimate would be approximately one half million students each year. A course could be distributed as a textbook and a number of DVD discs containing programs and multimedia pedagogical components as well as course administration support components. A Norwegian and a very large international publishing house have stated their interest in the commercial aspects of this product. We believe that the course-building competence and tools developed in COOL will be useful later, also in a commercial sense, both through contract research and development and through commercial channels. We have to realise, however, that the global setting and cooperative work in the COOL Project may create special problems, not usually encountered in cooperation with publishers. We will provide sets of Examination Problems, with Answers and Comments. We want in the COOL Project to provide didactical modules that will convey an awareness also of other relevant perspectives in system development and use, in addition to the strictly technical ones: different functional roles, different interest groups, different social sciences. These components should step by step create a "Learning Landscape". We want in the COOL Project to supplement the pedagogical components with organisational components to support group work and net-based studies, as well as tools for teachers and students in the administration of their processes of learning and teaching. We want to explore the advanced hypertext facilities of the Danish DEVISE project (now distributed by Hypergenic) to develop tools for defining alternative ways of using the components in the Learning Landscape. We will want to have Learning Managements Systems that are compatible in all test sites. Not necessarily the same systems, but with a defined common set of attributes for the courses, their cont and the students. In this case, as well as in many other cases we will prefer to agree upon (possibly modified) existing software. InterMedia is an interdisciplinary centre working on social, cultural, pedagogical and technological aspects of information and communication technologies. The centre focuses new media and net based learning. InterMedia is a research centre with media production facilities, located in Oslo Research Park. Some 30 researchers, research fellows, producers and other staff work at the centre. The researchers have background in informatics, education, sociology, media studies, cultural studies and linguistics. InterMedia has developed a research group on Computer Supported Collaborative Learning (CSCL), working closely with InterMedia at the University of Bergen. The Faculty of Education is the administrative host of InterMedia at the University of Oslo. However, six of the eight faculties are represented on the board, which has external members as well. The Simula Research Laboratory is a new central Norwegian laboratory for basic research, established by the Departments of Informatics at the universities in Oslo, Bergen, Trondheim and Tromsø, and the Norwegian Computing Center and SINTEF (The Foundation for Scientific and Industrial Research at the Norwegian Institute of Technology). It is named the Simula Research Laboratory after the Simula languages, the first object-oriented programming language, developed in Norway in the 1960s. Simula Research Laboratory performs basic research within selected areas of eScience; improving software design and development processes, developing methods and software for computing and visualisation, and investigating and creating communication technologies for the future information infrastructure. Projects at Simula Research Laboratory relevant to COOL are concerned with studies of object-oriented development methods, techniques and tools combined with existing and new processes for developing complex software systems and evaluation of such technology. Norwegian Computing Center (Norsk Regnesentral) is an applied research institute. NCC is a private and independent non-profit foundation. NCC conducts contract research for a wide range of industrial, commercial and public organisation in the national as well as the international market. Projects and activities of NCC that are relevant to COOL are numerous due to NCCs key role in the history of object-oriented programming and modelling, dating back to the SIMULA programming language (1963 and 1967). The Department has primary responsibility at the university for research and teaching in the field of informatics. The research activities in the following research groups are particularly relevant to the COOL Project. The Industrial System Development Group focuses on models, methods, techniques and tools for system development in an industrial context and empirical research methods for validation of such technology. The Software Engineering and Databases Group does research in the field of development, maintenance, correctness, and efficiency of large program and data systems. This research traditionally has been centred around object oriented languages and databases. The mission of the Systems Development Group is to advance the field of design and use of large scale information systems through empirical research. The research in the group rests on a tradition emphasising user participation in development of information systems where technical issues are embedded in work-oriented, organisational, and political matters. The COOL Research Community (Sections 3 and 4) is not only well acquainted with most aspects of the relevant research, but a several of the members are internationally well known for their important contributions. Annita Fjuk, Associate professor, Dr. Scient, will be working at InterMedia. She will join the team in the second half of 2002, and then become the project leader. Annita Fjuk is specialising in remote and in collaborative learning. Kristen Nygaard, Professor (emer), now employed at the Norwegian Computing Center, will be the senior researcher in the COOL team. Kristen Nygaard invented (with Ole-Johan Dahl) object-oriented programming, he created with one team (Erik Holbaek-Hanssen and Petter Haandlykken) the DELTA system description language, with another team (Bent Bruun Kristensen, Ole Lehrmann Madsen and Birger Moeller-Pedersen) the BETA object-oriented programming language. Later, in the 1990's, he headed the GOODS/STAGE development teams (Haakon Bryhni, Dag Sjøberg, Ole Smørdal, Dag Belsnes, Jonn Skretting, Kasper Østerbye and Birger Moeller-Pedersen). He was the key researcher (working with Olav Terje Bergo) in the trade union projects that have the Data Agreements as important results, and he founded the "Scandinavian School" in system development. He has since 1994 also been working on contributions to a unifying object-oriented platform for informatics, and tested out his ideas on how informatics should be taught. This material is the starting platform for the COOL Project. Among Kristen Nygaards awards we may mention the ACM A.M. Turing Award, the IEEE John von Neumann Medal, and the Norwegian Rosing Prize (all together with Ole-Johan Dahl). He has also been appointed Commander of the Order of Saint Olav by the King of Norway. In October 1990 the American association Computer Professionals for Social Responsibility awarded him its Norbert Wiener Prize for responsibility in social and professional work. In June 2000 he was awarded a Honorary Fellowship for "his originating of object technology concepts" by the Object Management Group. Naci Akkøk, Researcher NCC, former leader of the OMNI group (Object Technologies, Mobile Computing, Networked/Distributed Solutions and Innovations). Bjarte M. Østvold, Senior Research Scientist, NCC. His interest has been in applying formal methods and advanced programming language technology to solve practical problems related to software development. Edgar Bostrøm, Associate Professor at the Østfold University College will work 40% time at InterMedia and half time at the College (one of the test-sites). Edgar Bostrøm has many years experience in teaching at the college level, has written textbooks, and is a leading expert in teaching at the high school level. It is assumed that COOL shall provide tuition for a number of dr.scient.-students. There are already some very interesting tasks for theses defined, and COOL will have many qualified tutors available. In addition will the COOL community provide many high quality cooperating institutions to visit for young researchers. The COOL Project administration will be handled by the Norwegian Computing Center, whereas Annita Fjuk at InterMedia will be the project leader. Kristen Nygaard will be the Senior Researcher in the project, working full time. COOL is to a large degree built around his work and his new ideas, and it is reasonable to ask if this represents a risk for the project, since he is now 75 years old. The situation is, however, that the main ideas and a number of research tasks and didactical modules are well developed. As soon as the teams have worked together for some time, the COOL Project may be finished successfully even if he should become unable to participate. The COOL Project will have a Steering Group following the management and main course of events. It will consist of one representative for each consortium member, the project leader, a representative for the test sites, and two external researchers: professor Ole Lehrmann Madsen, Aarhus, and professor Kjell Bratbergsengen, the Norwegian Technical University, Trondheim. The COOL Project will also have a Professional Reference Group that may discuss and be consulted on important professional issues. The Department of Computer Science, Aarhus University, Denmark, and the Center for Pervasive Computing, Aarhus University will be active partners in the project. The Department of Computer Science has for many years had one of the best research groups in Europe in object-oriented programming. It also has long experience and a strong interest in teaching object-oriented languages. The goal of the Center for Pervasive Computing is to become one of the leaders within next generation computing environments where information and communication technology is everywhere, for everyone, at all times. The centre develops new concepts and technology for support of activities and processes across time and space based on a broad spectrum of media, equipment and locations. The centre contributes to the development of business models based on pervasive computing and models for start-up companies, e.g. in the form of business incubators, with science and development park facilities and access to venture capital. COOL will benefit from the general competence in Aarhus,, and there is a firmly stated intention that some of their research projects shall link to COOL, and that they will use results from COOL. A major objective of COOL is to create modules for an introductory course in programming and system comprehension for universities and colleges around the world. Early in he project planning we realised that we ought to establish cooperation with some universities/colleges that would try out our pedagogical modules. It turned out that many informatics departments were interested. We then decided that we wanted to have test sites located in a number of different language/culture worlds - North and South America, Scandinavia - in order to expose the modules to different cultural backgrounds. The response to this has been very encouraging, and we had to reconsider the objective of COOL, realising that we had the opportunity of creating a truly global set of test sites. The situation is today that we will establish at least these language/culture worlds: Scandinavia, France, South America, North America, China. We will discuss the establishment of test sites in India in the near future, and next year contacts in Africa will be evaluated. We feel that at least five sites should exist in each world, and perhaps not more than ca. fifteen. In each world one test site will have a researcher who will function as coordinator for that world. In the central COOL team in Norway one of the senior researchers will have contacts with these world coordinators. The global set of test sites will provide unique opportunities for comparative studies of didactical tools and techniques in informatics. Datalogisk Institut, Aarhus Universitet, Denmark. Michael E. Caspersen is responsible for the introductory education at the department. He will also do research within the COOL project. University of Lund, Sweden. Professor Boris Magnusson is the site coordinator. Østfold University College, Halden, Norway. Assoc. Professor Edgar Bostrøm is the site coordinator. The Technical University of Norway, Trondheim, wants to participate. Professor Kjell Bratbergsengen is the provisional contact person. We want at least two more in each of the three countries. Ecole des Mines, Nantes, France. Professor Pierre Cointe, a leading French researcher in object-oriented programming is currently the contact person. At Université de Nantes, France, another leading researcher in object-oriented programming, Professor Jean Bézivin, is the contact. It is necessary to get a really good university to be the first test site. In April 2002 Kristen Nygaard presented COOL to the teachers of introductory programming at the University of Newcastle. Contacts will continue after the summer. If Newcastle, or another strong university wants to join, we will try to expand to ca. 5 sites in UK. Otherwise we will concentrate our efforts in other language/culture worlds. Escuela Politecnica Nacional, Quito, Ecuador. Professor Hugo Banda will be the coordinator for the COOL test sites in South America. Two other universities in the Quito region intend to join. Universidad Catolica Nuestra Senora de la Asuncion, Asuncion, Paraguay. Professor Luca Cernuzzi will be the local coordinator. We expect a number of other test sites. University of British Columbia, Vancouver, Canada. Professor Gregor Kiczales is the main contact. Gregor Kiczales is the key researcher in the field of Aspect-Oriented Programming. Northeastern University, Boston, USA. David Lorenz is professor at Northeastern. He will be coordinator between the COOL test sites in North America. San José State University, California, USA, is considering joining COOL. Professor Sigurd Meldal is Department Chair and contact to COOL. Saint Thomas University, St. Paul, Minnesota, USA, Saif Islam is interested and contact person. We have many other contacts, and consider getting ca. 10 test sites, some of them being high quality colleges. We are not interested in elite universities with little emphasis on introductory undergraduate teaching. The Software College at Xidian University, XiAn, China, directed by Professor Chen Ping, will join COOL. Liu XiYang, now finishing his Ph.D. thesis at the Xidian University in Xi'An, China, will be the coordinator of the Chinese components of COOL He has already long experience in teaching object-oriented technologies and in their practical use. We would like to get 5 test sites or more in China. The Indian Institute of Management, Bangalore, wants to join COOL. Professor Rajendra K. Bandi will be the contact, and he will also contact other possible test sites in India. In 2003 Associate Professor Jens Kaasbøll at the Department of Informatics, University of Oslo will work together with African colleagues, and will try to establish contacts for COOL test sites. Ole Smørdal, Dr. scient. , Scientific Programmer, InterMedia. Ole Smørdal was one of the multimedia specialists at the Department of Informatics, and has his Ph.D. in system development. He is well acquainted with both Java, BETA, DELTA and GOODS/STAGE. Jens Kaasbøll, Associate Professor, Department of Informatics, will relate his cooperation with colleagues in Africa to the COOL Project. Professor Kaasbølls field are system development and the teaching of informatics. Birger Møller Pedersen, Associate Professor II, Department of Informatics, and researcher at L.M. Ericsson. He is a codesigner of the BETA language and of SDL-92 (supported and recommended by ITU, the International Telecommunications Union) that introduced object-oriented programming in SDL. He is a member of the OMG group designing version 2.0 of UML. Dag Belsnes, Professor II, Department of Informatics. Dag Belsnes is an internationally known expert on communication software, and has been member of the ISO group on Open Systems Interconnection. He has worked with Kristen Nygaard on the development of the Theatre Metaphor and the STAGE Project. Kai Grønbæk, professor at Aarhus University, is a leading expert on hypertexts. Graham Birtwistle, Professor, Leeds University, will spend some months at least one of the years. Graham Birtwistle wrote the first textbook on SIMULA, has developed a problem-oriented object-oriented language (DEMOS), and has been working in program proving. Joel Spiegel has been working with Apples Advanced Technology Group and Microsoft. He the joined Amazon.com and became Vice President. He is now having three sabbatical years, cultivating his family and his professional interests, including participation in the researchers group associated with COOL. Algorithm Animation, and Animations in General for Computer Science Education. Use of the WWW for Cooperative Learning. Mjølner Informatik, Aarhus, Denmark, is a commercial company established at the suggestion of the Nordic Industrial Fund. The Fund had supported the production of compilers for the very general and modern object-oriented language BETA, and wanted that the product should become generally available. Mjølner now is doing quite well as a consultant company on jobs not related to BETA. The company produces and gives away BETA systems free of charge for a wide range of computers. We are going to use these compilers in the COOL Project, and we need assistance in extending an/or modifying them. Mjølner has promised to give this assistance without charges, since the support of BETA is among the objectives of Mjølner. It is not expected that the contracts between Mjølner and COOL will contain arrangements for money transfers in any direction. Hypergenic, Aarhus, Denmark, is another company related to Aarhus University. They have developed a very advanced and powerful hypertext system that we will need. Since we will develop a new type of application, they will probably give us favourable contract conditions. Universitetsforlaget, Oslo, Norway. On 23 May 2002 Kristen Nygaard presented the details of the current state of the COOL Project to Arne Magnus at Universitetsforlaget. They agreed that there was no need for imminent action. Arne Magnus stated, however, that the development of COOL over the last few months created a much clearer picture of the market position of the COOL modules intended for publication and distribution in a variety of formats. He felt that time now was ripe for him to discuss COOL with key people in Universitetsforlaget, so that the publishers could participate well prepared in discussions about alternative strategies in the months to come. He could see a definite role for Universitetsforlaget in Norway, and possibly Scandinavia. We agreed that a contact with a large international publisher (as Pearson Education) would be very interesting, and also open up for a role for Universitetsforlaget." (Pearson Education is the largest group of science publishers in the world. Ethical problems in relation to system development will be discussed in the project. The COOL Project research process is in itself not expected to raise ethical problems to any unusual degree.